Dubai is well-established as the Gulf’s financial and trade hub, with a reported gross domestic product (GDP) of Dh390 billion in 2017. The infrastructure is undisputed, with extensive connectivity, strong economic prospects, a low tax system and safe haven status. The fundamentals of real estate, healthcare and education are complemented by world-class amenities, while continually improving business legislations mean Dubai has long surpassed its regional peers. However, as the Gulf’s commercial landscape matures and other economies look to improve the ease of doing business, Dubai’s evolution must continue to cement its position as the location of choice for multinationals eyeing a Middle East headquarters. We believe opportunity for future growth lies in the further development of Dubai’s soft infrastructure and aligned to the rapid improvements made on the hard infrastructure. 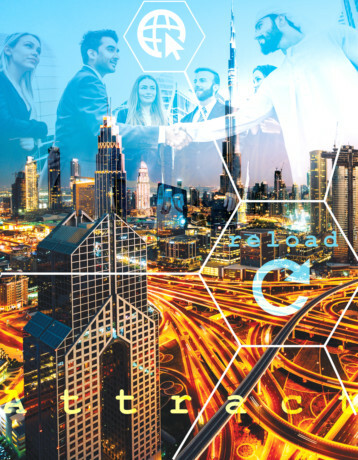 To be a magnet for global corporations, Dubai needs to prove it has the foundations in place to attract the talent that will make these multinationals move. Around 300 infrastructure projects have been completed since 2004, worth an estimated Dh42 billion. A further 128 projects worth in excess of Dh55 billion are in the planning or execution stages to be delivered by 2045, according to research from Knight Frank and MEED Projects. The commercial sector is transforming, with increasing accessibility via free zones having a significant impact. • 248 greenfield projects approved or launched involving FDI in 2018, ranking it third worldwide. The UAE climbed 10 spots to 11th place out of 190 in the World Bank’s annual ease of doing business rankings, in recognition of four reforms related to ease of starting business, getting electricity, registering real estate and gaining access to credit. These rankings reflect investor confidence in Dubai’s economy and reaffirm the diversity, competitiveness and attractiveness. What’s next? How can Dubai best leverage its position as a trading hub to be the destination of choice for global corporates seeking a base not just in the Gulf, but wider region and beyond? The next era of development should revolve around investment in people via the soft infrastructure that makes Dubai one of the world’s most desirable places to live and work. We predicts a conscious movement towards workspaces close to talent pools, but which have the amenity, service and infrastructure to assist in the retention of that talent. Here opportunities abound. Of the 100 global corporate real estate leaders surveyed in the our occupier survey, 62.1 per cent said the total space in their global portfolio would increase over the next three years. More than a quarter said “access to talent” would be the key driver in their business’ mobility over the next three years. A quarter of the FTSE 350 have already moved headquarters in the past three years. Occupiers are increasingly active and ready to move. Occupiers across all industry sectors are gravitating to markets or submarkets that were once terra incognita, as they search for the human capital needed to change focus and thrive in an operating environment disrupted by digital and new wave technologies. Critically, the skills almost all companies are seeking, namely creative and science, technology, engineering and mathematics (STEM) expertise, are in short supply globally. Corporates are settling in those locations where the talent concentrates rather than in those that simply provide financial incentives, have a historical connection with the company or meet with the locational preferences of the company’s leadership. Skilled staff determine the modern corporate location decision. The report concludes that as tech and creative talent gravitates towards locations that are urban, amenity rich, relatively affordable, and highly accessible with a solid transport infrastructure, companies follow. This is where we sees huge potential for Dubai to compete on a global scale. It has the transport, real estate, health care, and education infrastructure in place, lifestyles are among the best, and masterplanning for new communities, attractions and amenities continues. It’s behind the scenes, in the soft infrastructure, where there are opportunities for further development to attract talent. Recently, the Tecom free zone introduced a GoFreelance permit in Dubai Internet City (DIC), designed to help bring top talent to the technology community and foster creativity and innovation through independent, entrepreneurial minds. We expect to see more initiatives over the next year as part of Smart Dubai 2021, the emirate’s critical vision to be the world’s smartest and happiest city. Its six pillars include smart economy, with innovative economic conditions fuelling entrepreneurship, smart living and smart people, based on a culture of continual learning, innovation and participation in an inclusive society. Growth in these areas will help bring talent to Dubai, making it more attractive for those global corporates eyeing the region and ensuring it maintains its pre-eminent position. Ultimately, it’s people that will drive the next transformation in Dubai’s commercial sector.